With both Republicans and Democrats split over the prospect, a liberal supporter of American action against the Assad regime says the current situation is neither Iraq nor Rwanda. Like Obama, Tom Perriello, a former congressman from Virginia who now serves as president of the Center for American Progress Action Fund, strongly opposed the Iraq war. But he now strongly backs action in Syria. Perriello has extensive experience with conflicts in the Middle East and Africa, having worked on the peace processes in Sierra Leone and Liberia and as a consultant in Kosovo, Darfur, and Afghanistan. Perriello speaks for himself, not the White House, but his perspective sheds light on the case some Democrats are making for this intervention. This is an edited transcript of our conversation. There’s a lot of ambiguity in the word “intervention,” with interpretations ranging from a single bombing raid to fully going to war. What do you think is the right course? The short answer is I don’t know. There’s a tremendous amount of intelligence one would want to look at to answer this question. It’s always true, but in this case it’s particularly true, that the best you are going to do is probabilities. Most advocates only look at the probabilities on one side. Those who don’t want to intervene talk about the probability of things going wrong, which absolutely exists; there’s no way to get rid of it. Those who want to intervene focus on the probability of damage if we don’t intervene, and there we have a higher degree of certainty, because we’ve already seen 125,000 killed. Within that context, you have to look at a set of tactics. A lot of people seem to be dismissing the idea that there’s any role for a surgical, strategic strike short of regime change. While I have advocated for a more aggressive posture that would potentially include regime transition, there is absolutely an argument for inflicting some cost to the regime for the use of chemical weapons against the civilian population. What is that? I would say there’s some value to crippling some part of the military infrastructure, which would relate directly to the capacity for using chemical or biological weapons, or other infrastructure. And that I think you can do largely from the air without a lot of involvement on the ground. Simultaneously, there has to be a continuation of the diplomatic engagement we’ve been doing. But if the objective isn’t regime change, what is the objective? Aren’t you weakening the regime and allowing the rebels to gain an upper hand in the civil war? Is the point really just to make a statement in the hope other irrational dictators would be deterred by it in the future? There is an interest, not just by us but by the community of nations, in creating a significant disincentive to the use of chemical and biological weapons, which even repressive regimes, on the whole, have treated as off-limits. This is a technology that allows regimes who do not want to bomb their own civilian infrastructure to kill and do damage to a great number of civilians. [Syrian President Bashar al-]Assad clearly has been escalating and will consider doing it again. When he does, he is going to make some assessments about whether the benefit he gets domestically from using those weapons is larger or smaller than the cost he has to pay for using those weapons. Even if in some ways he is well beyond all rationality, he is going to make that calculation. You think an irrational dictator whose objectives are focused on defeating internal opposition is going to respond to incentives? It’s part of his calculation. He knows if we intervene, his days are over, so part of what he’s doing, like a petulant child, is seeing how far he can push before we come in. Traditionally, the use of chemical and biological weapons, with very few exceptions, has been something you cannot do without invoking dramatic action. With Assad, we are talking about a regime, not a cult of personality. He is not Idi Amin or Charles Taylor. Assad is one component, but there is also the military leadership. Those who are empowered to make decision are going to internalize that cost of having gone too far. On the other hand, if he starts to feel he can get away with it, he is going to escalate, and more people are going to die. He has given every indication that he is reading the international community’s willingness to care fairly well. 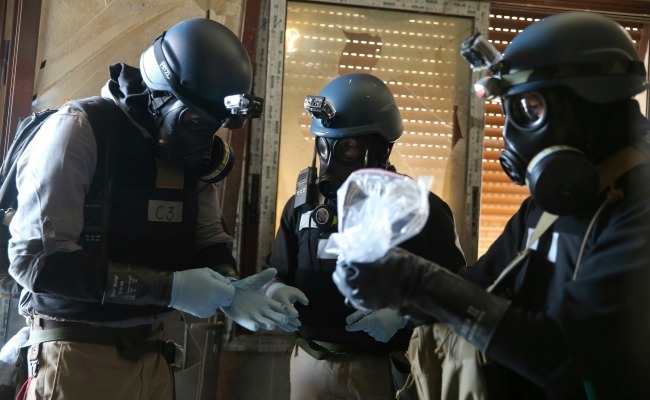 The use of chemical weapons appears to have been a miscalculation, though maybe not, since a lot of people in the U.S. still don’t want to act. You just said, "If we intervene, his days are over," but isn’t the whole premise of a non-regime-change strike that his days are not over and he gets to stay in power? He knows if we came in full-bore his days would be numbered. We are not committing to that. What the president is proposing is not that. We’re going to poke and see what kind of poke we get back. Clearly he does want to annihilate the opposition in Syria, armed and unarmed. We are saying, no, you can’t do that, the price you pay for that actually is higher. If he were to then [escalate further], like taking a swipe at Israel, that’s going to bring us in. We may not have the power to successfully rebuild afterward, but we have certainly shown we have the ability to take out a regime effectively, and if you’re Assad that’s what you care about. You can have multiple objectives with one being primary. I use the analogy of a biology teacher whose student is failing the class, and you know the student is also failing another class, and if he fails biology he’s going to fail out of high school. You say, “If you don’t pass this test, you’re going to fail this class,” and you’re not failing him from high school -- it’s in his power to deal with other factors -- but that will be the effect. I think that’s a bit of where we are right now. I’m someone who believes there were grounds [for U.S. intervention] before chemical weapons were used, but at the same time, one of the most important victories of the human community, and something very rare in history, is that we’ve developed the ability to do something and at the same time said it’s not acceptable to do it. The use of chemical and biological weapons is one of the rare cases of this. So people say, “Oh, why do you care about the 2,000 or 3,000 dead here [from chemical attack] and not the 120,000 [previously killed in the conflict]?” Well, I do care about them. I think that was grounds for aggressive engagement. But there’s also this other element. To intervene and say we’re going to take just this strand, to inflict a cost on Assad for using chemical weapons -- sure, that’s more relevant because he happens to be in a civil war. But what we’re saying is it’s not OK to use these weapons, and if you do, this happens. He’s the one making that gamble in the context of a civil war that he was once losing and where he now appears to have the upper hand. It’s Assad who has made the decision to create that situation and now has to handle the consequences of how it will affect his standing in a civil war. If we really wanted to do regime change, we would be looking at a different set of tactical options for this. For me, it seems like a pretty clear distinction in a murky situation. But the implications may be that. I’ve said for over a year now [that Assad needs to go], but that doesn’t mean that the way I think he should go is bombing him out of existence. I think the diplomatic approach is the right way. Most wars ultimately end with some form of negotiated peace; the question is who goes into that negotiation with a position of strength. What about the worry that intervening, while done with good intentions, will exacerbate the situation on the ground and put more Syrians at risk? We are at full civil war in Syria. People are already being slaughtered. It is street-to-street warfare. The notion that we are somehow going to stir the pot more is one I disagree with on the merits. Also, while Syria’s neighbors have remained stable, there’s great concern that if this goes on in a protracted way, over a period of years, you could see Jordan, Lebanon, Turkey all moving from stable to more instability. One of the reasons I came to the conclusion a year and a half ago that we needed to intervene is that both sides appear just strong enough not to lose. That’s what leads to civil war that lasts for years and years, with hundreds of thousands dead, millions displaced, and a cancer that spreads through the region. Isn’t a high level of skepticism of optional involvement in Middle Eastern conflicts rather warranted after what happened with Iraq? There’s a lot of talk about, oh, is this Iraq or is it Rwanda? I tend to agree with the notion that this is closer to Kosovo, with the main difference being that the opposition is not as trained or coherent as the KLA was. The rationale for going in matters. [With Iraq, it was] the notion that it was connected to 9/11 and had WMDs, both of which turned out not to be true. You also had a nation that was in a position of relative stability, not an existing civil war that we decided to engage in where people were being slaughtered. It was a country that was incredibly repressive but relatively stable, and we went in and changed that. Here is a situation where people are dying in huge numbers and being displaced in a region that’s already destabilized, not a situation where a highly objectionable dictator is using his power to ensure stability. So even if Bush had made the humanitarian argument from the beginning, instead of ex post facto after the other rationales fell apart, Iraq was an “if it’s not broke, don’t fix it” situation. Syria is already broken. But absolutely, [intervening] means being engaged more deeply in a region of widespread instability where we’re not well regarded, at a time when Americans are war-weary and we’re facing a budget crunch. I get that. Does Obama need to consult Congress? Doesn’t it matter that public opinion seems pretty solidly against this? Whether or not there’s a legal issue with going to Congress, for the American people, there’s clearly a moral and strategic need to make the case more forcefully. A nation’s army is stronger when the people are behind it. The president needs to go out and make the case in a way he hasn’t yet. The rhetoric has been strong, and now he needs to go out and try to explain why we believe the use of force is necessary in this situation. I honestly don’t know what the president is going to do, but if it’s two weeks of bombing and then detente, the American people are going to feel differently about that than four or five weeks of bombing that ends ambiguously. I’m loath to use Iraq as an example, but if you look at Iraq and other conflicts, the American people are generally against it until we go, then they rally once we start, and then over time they make a judgment about how things are going. In this case, the right and left seem more skeptical than usual going in, but I think you will see some rallying, and then people eventually turning against it if it’s not going our way. The president should consult Congress. It’s always a good thing, and I think he’s doing that. But I also think some members of Congress want to focus on the process so that they don’t have to take a position on the actual issue. “Oh, I have concerns, I’m worried about getting entangled,” that’s a convenient way to wait six weeks and then when things are not going well you can say you never supported it. With Libya, you had a spineless Congress spend weeks berating the president for not going forward, then vote against it. That’s the sort of gutlessness you can engage in when you don’t have to sit in the chair. Do you see an irony, or a pathos, in Obama being compelled to undertake this kind of action after essentially campaigning as an antiwar candidate? I reject that premise. I was against the Iraq war, and I don’t consider myself a pacifist or an anti-war person. To me, there are a number of elements that go into whether you intervene in a given situation. This president is not someone who is opposed to the use of force -- you see it with his use of drones, which some see as a strength and some are bothered by. The difference between force and violence is legitimacy. As progressives in foreign policy, we tend to believe legitimacy matters. There is definitely, I would imagine, a frustration for those who did want to set a new tone in American policy, that it’s taken five years of trying to undo things that couldn’t be undone overnight, like Iraq or Afghanistan, before you could start to set a different framework of progressive use of power. And we aren’t out of that yet.